Here our association has an origin option to reference the categories association on the Asset model. We could instead specify type: :HAS_CATEGORY again if we wanted to. What if we wanted to get all assets that share a category with our asset? I find Cypher easier and more powerful than SQL, but we won’t worry too much about Cypher in this article. If you want to learn more later you can find great tutorials and a thorough refcard. We are defining variables as part of our chain to use later (c and asset). Did you notice that there is not a GROUP BY clause? Neo4j is smart enough to realize that collect and count are aggregation functions and it groups by the non-aggregation columns in our result (in this case that’s just the asset variable). Here we delve deeper and start forming our own query. The structure is the same but, rather than finding just one path between two assets via a shared category, we also specify two more optional paths. We could make all three paths optional, but then Neo4j would need to compare our asset with every other asset in the database. By using a match rather than an optional_match for our path through Category nodes we require that there be at least one shared category. This vastly limits our search space. With this you can display all of the assets which a user can see either because the asset is public or because the viewer owns it. No problem, but again not a big deal. In another database you could just do a query on two columns/properties. Let’s get a bit crazier! That would have been a join table otherwise. Here you just throw in another path by which users can have access to an asset. You take a moment to appreciate Neo4j’s schemaless nature. That was pretty easy, since you just needed to add another path. It’s two hops, sure, but that’s old hat for us by now. 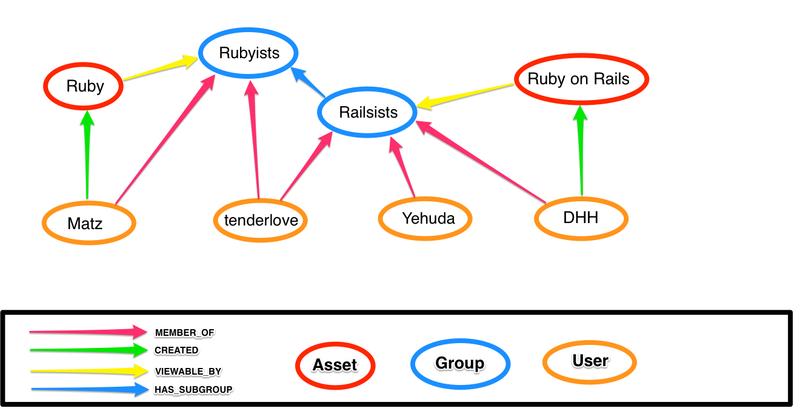 Tenderlove and Yehuda will be able to see the “Ruby on Rails” asset because they are members of the “Railsists” group. 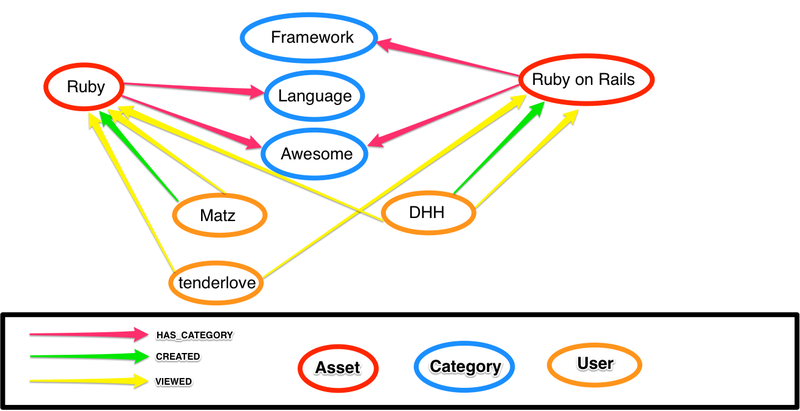 Also note: now that some users have multiple paths to an asset (like Matz to Ruby via the Rubyists group and via the CREATED relationship) you need to return DISTINCT asset. Here you’ve done it! This query will find assets accessible to a group and traverse any set of zero to five HAS_SUBGROUP relationships, finally ending on a check to see if the user is in the last group. You’re the hero of the story and your company showers you with bonuses for getting the job done so quickly! There are many awesome things that you can do with Neo4j (including using it’s amazing web interface to explore your data with Cypher) which I’m not able to cover. Not only is it a great way to store your data in an easy and intuitive way, it provides a lot of benefits for efficient querying of highly connected data (and believe me your data is highly connected, even if you don’t realize it). I encourage you to check out Neo4j and give it a try for your next project!